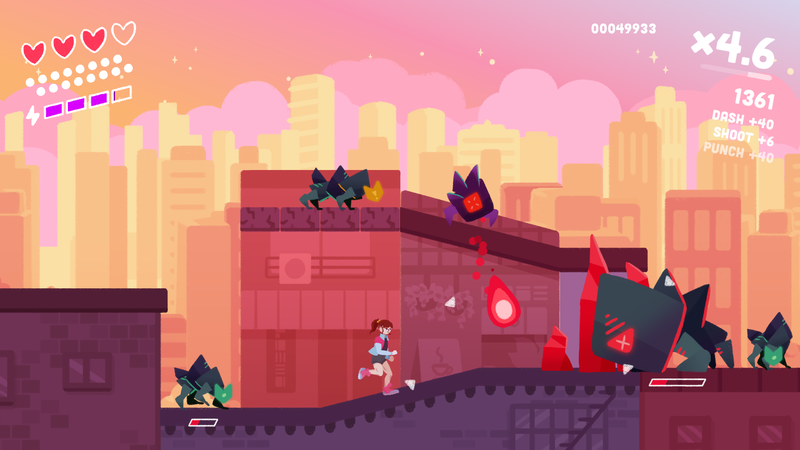 In Super Crush K.O., not only is there a massive invasion of AI swarming the Earth, but your cat has been kidnapped. You as the player character certainly have your priorities straight. 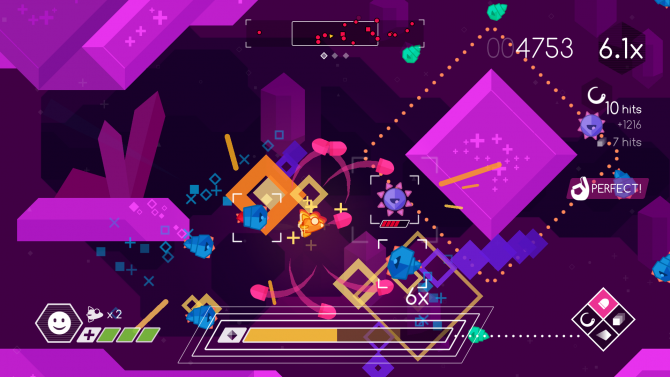 From Vertex Pop of Graceful Explosion Machine fame, this beat-em-up/shoot-em-up follows that title’s philosophy of remixing familiar game genres with a colorful and vibrant art style. 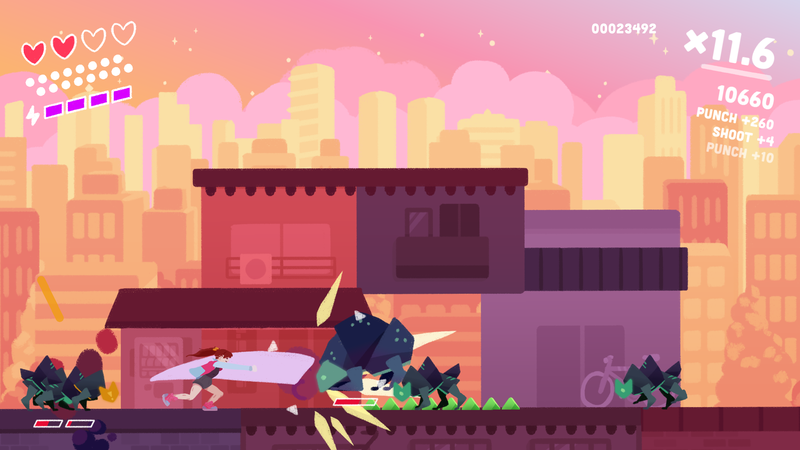 Similar to Graceful Explosion Machine, Super Crush K.O. has a focus on combos, although with a letter grade system rather than a number multiplier. 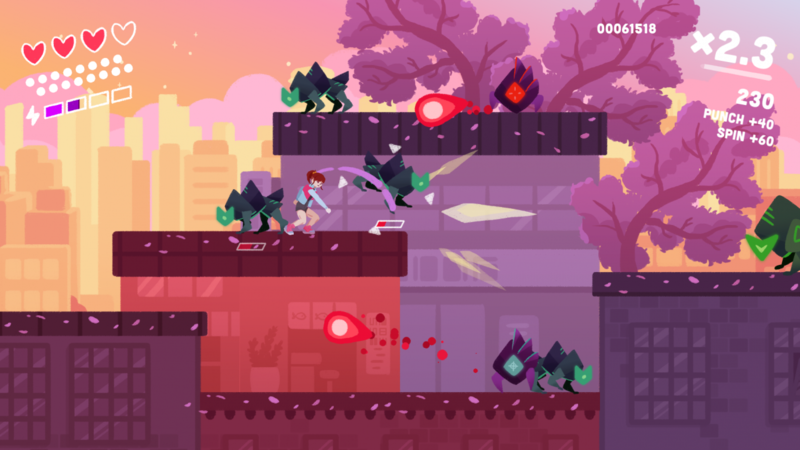 Standard punches and kicks are complimented with a blaster, and the toolset expanded during this PAX East demo with a variety of special moves. Add some variety to how you switch up these moves, and you can work your way to an S rank. For myself, it recalled the Devil May Cry series with its focus on variety and combos, albeit side-scrolling rather than 3D. The most obvious differences are the visuals and overall tone, which is evident mere seconds after starting the game up. Nearly every part of the environment is a different shade of pink or purple, with buildings and geometry being round and soft. Robot enemies, on the other hand, stick out with different colors and inherit a more jagged design. They don’t appear too out of place with the color world of Super Crush K.O., but they are distinct enough to appear as targets. 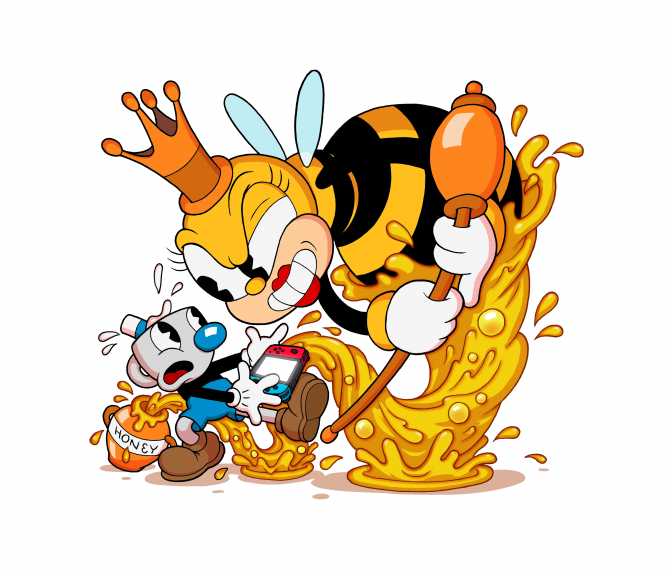 Overall, the game is quite smart with how it uses color, not only to serve the world-building and artistic design but for certain indications in gameplay. Your character’s main defensive move is a dodge, a little dash that lets you avoid enemy fire. Not only that, but your dodge negates those enemy blasts. Different robot attacks and obstacles will have the same bright red color. Using color to indicate specific things in the environment isn’t a new concept, but this use particularly fits well in this game’s colorful world. Special moves in the demo came from food stands—a warm pretzel provided the ability to “Twister Drill,” cheesy pizza gave an “Uppercut Slice,” and salty sweet popcorn was the source of an “Air Pop.” Pretty soon, it became fairly obvious how each of these moves was meant to work into a combo. The Twister Drill was for going through enemies in front of you, the Upper Cut Slice juggled enemies, and the Air Pop gave some vertical movement options and attacks. By chaining all of these moves together, along with my standard punches, kicks, and the auto-targeting blaster, I got to an S rank in no time. It wasn’t possible to reach that rank until I had obtained all of those moves, so I was surprised how relatively easy it was to reach that rank. I was told that an even higher rank was possible, though it wasn’t necessarily possible in that demo. 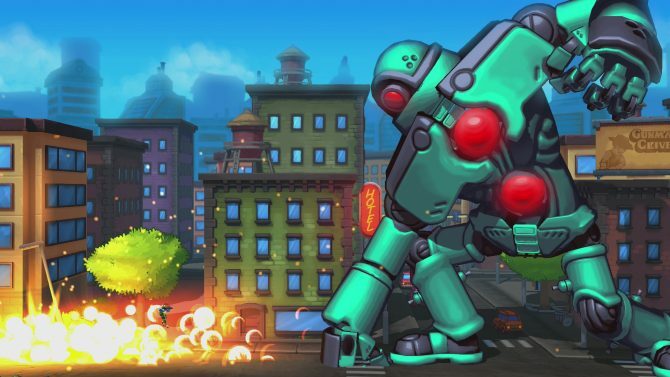 Enemies included four-legged melee-focused robots and crab-like robots that shot projectiles. Eventually, at the end of the demo, I encountered a miniboss, which was really just a larger version of those crabs. It lugged around, surrounded by smaller enemies, hitting the ground and summoning these red shards out of the ground that I was able to use dodge on. It took me another try to fully get this sequence. 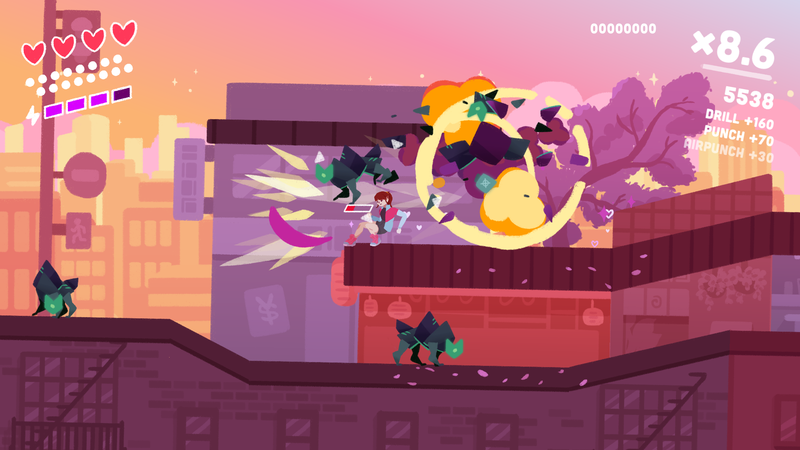 It was tough with only four hearts of health, so I can imagine just how brutal Super Crush K.O can get later on. Combine that with an ammo meter for your blaster and another bar for your special moves (this can be refilled with pickups from fallen enemies), and you have a battle system where conservation is important. Seeing how the game encourages variety in combat, it looks like players will have to find a fine balance between using and saving meter when utilizing the entire toolset of the game. It is refreshing to see an invasion apocalypse game that isn’t brown or photorealistic, and the John Wick-like focus on a pet for the main premise is a funny pitch. Playing the demo in handheld mode on the Switch I didn’t hear too much of the music on the loud PAX East show floor, but judging from a video I found “chill” is the word I’d use to describe it. Super Crush K.O. has a wonderful art style and gameplay that feels as smooth as it looks. Even though Super Crush K.O. doesn’t innovate much, I can imagine this art style being the main selling point for those otherwise turned off by grim-dark or hard-edged games. While the demo was somewhat of a breeze, I did notice other people struggling at parts, and the miniboss sequence did trip me up. We’ll have to wait until sometime later in 2019 to see just how much of a challenge Super Crush K.O. will be on PC and Switch.